Discussion in 'Air Force' started by Inst, Sep 1, 2018. Since Deino has said that nozzle discussion on the J-20 is off-topic, shall we take it here? One final possibility regarding Gongke is that the J-10B was not testing the nozzle, but rather testing the WS-15 engine. This is understandable in one sense; the J-10B is an approximately $50 million fighter, while the J-20 is approximately $100 million. On the other hand, the risk of losing the craft is dramatically greater on the J-10B than on the J-20, since the J-10B is single-engined. Ideally, the best test platform would instead be a J-11, but Chengdu doesn't run J-11s and would have to reach out to Shenyang to test the engine for the J-20. "Big brother, I finished testing the new nozzle for you. It feels really powerful/empowering!" 给力 in this case can be translated both literally and metaphorically, however, given common Chinese use. But if we take it literally, could this not be seen as evidence that it was the WS-15 in testing, not the nozzle? Check out this picture, and compare it to shots of the WS-10 engine. In the first pic, the first segment of the exposed engine goes out to only 16% of the length of the tail fairing, ignoring the white EW probe. In the second picture, the first section goes all the way out to 23% of the same distance (use the lower aircraft). Now, it's possible that this is just a matter of the whole nozzle; i.e, the exterior of the first segment is already modified as a part of the whole engine, but it does raise the possibility that the J-10B wasn't using a TVC nozzle mounted onto the WS-10. SilentObserver, AleDucat, Air Force Brat and 1 other person like this. Yodello, AleDucat and Air Force Brat like this. Via sinosoldier on the other thread. Measuring from this image, we should get 13% vs 23% on the WS-10. I'll pour over diagrams to see if it's possible this represents a change in engine dimensions. In my opinion the J-10 was testing an engine. Serrations on the engine nozzle is for RCS reduction towards the rear, and does not necessarily mean TVC. Reducing rear hemisphere RCS can be directly helpful for the fighter. No, you got me completely wrong. Not the discussion on nozzles is off topic, but this IMO strange lesson some here gave to teach Chinese native speakers on how to interpret a Chinese text. Well, the interpretation of sources is important; as I've said before, Gongke101 is best considered as deliberately ambiguous; he could have been far more clear on the material, but he's divulging material that should be classified and at best, he's too scared to be direct. Re the engine itself, I took a look at the nozzle diagrams from the patent, roughly speaking, the nozzle corresponds all too well to the the diagram shown and it appears as though no part of the engine is technically sticking out. The big problem is that the WS-15 should be a few centimeters longer than the AL-31 and should also be about 100-200 kg heavier than the AL-31F and WS-10 (the latter are in the 7-9 T/W ratio class and between 125 kn and 135 kn, while the WS-15 should be in the 160-190 kn class with a 10 T/W). That extra mass has to go somewhere; if the engine segment were definitely longer than on the WS-10, we could clearly conclude that it's not the WS-10 being tested. As is, with the nozzle being of roughly the same dimensions, if not less, it is probably the WS-10. Via Huitong's site, for the WS-10A. The nozzle actuators are covered by a cowl on an installed version, which is the middle segment you see there. The other part of the rear section is a fairing over the engine itself, with the rear segments being afterburner fairings. The biggest problem with the idea of testing the WS-15, though, is that the gearbox location in the WS-15 for the J-10 should be different than from the AL-31F, meaning that the WS-15 either has to be compatible with both the J-10 and twin-engine J-20, or the engine is some kind of WS-10. About dimensions, an afterburning turbofan is a turbofan with afterburning sections attached. Supposedly the dry thrust of earlier WS-10s are around 71 kN, meaning that the thrust added by the afterburner section is about 61 kN. The rumored WS-15 figures are about 105 kN with 170 kN military thrust, implying that the afterburning section should be able to add another 65 kN of thrust. So the afterburning section should be a bit longer than on the WS-10, but the additional length could be contracted into the engine itself, by using a more compact, higher pressure turbofan section. Not sure, I'd have to look up information on the pressure levels of the WS-15 turbofan and look at it in comparison with the AL-31 and WS-10. 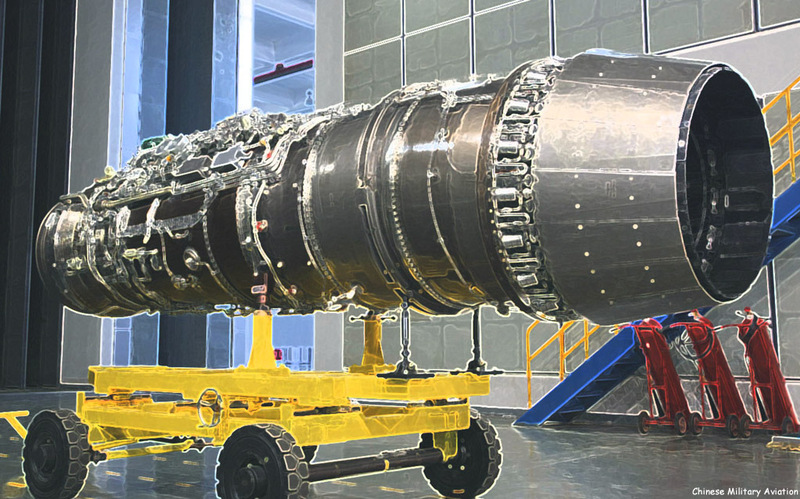 One interesting tidbit comes in this form: when we talk about engine dimensions, the WS-10 is somewhat shorter than the AL-31, but the WS-10 has 12 pressure stages in its compressor, while the AL-31 has 13 pressure stages. The WS-15, in contrast, has only 9 pressure stages (3 low, 6 high). This may contribute to lower length, but wiki seems to state the total length is about 5.05 meters, compared to the 4.95 meters of the AL-31, presumably including nozzle. But Shenyang are the WS-15 manufacturer, right? So a J-11 is a complete no-brainer if you don't want to commit a J-20. Also, its podded engine nacelles and intake ducts make structural modifications to accommodate an engine of significantly different size and airflow requirements much more straightforward. 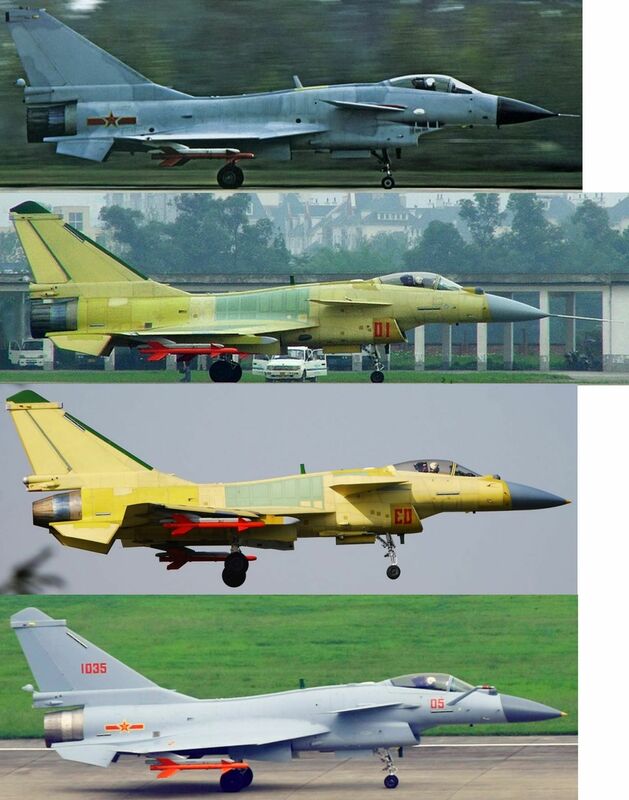 Using a single-engine J-10 makes no sense whatsoever. The airframe/nozzle flange appears to be in roughly the same location relative to the rudder hinge on all of those aircraft. On the tail sting (brake parachute housing) there is a diagonal break that is almost an extension of said hinge line, and in every case pictured the airframe ends and the nozzle begins slightly aft of where that panel gap meets the fuselage. So the differences you mention are purely nozzle-related. The petals do have the Salyut-style mid-length hinge which is known to be typical of Chinese bench-tested TVC prototypes, and the host aircraft has been fitted with mounting points for an anti-spin chute. Yes, the nozzle also has RCS reduction features, but that does not preclude TVC capability, does it? Occam's razor guys - it's a WS-10 with a LO TVC nozzle. The nozzle flange is actually not in the same location relative to the rudder hinge. One possibility is just that the actuator fairing is mounted to cover the flange, instead of at its end. That gives me figures identical to the WS-10 flange points. New single engine stealth fighter by chengdu?